With spindles that tilt either direction, as well as a space-saving footprint, it's easy to see why so many manufacturers love the Tesker Model 320 2-Die Thread Rolling Machine. Rolling Pressure Adjustable to 80,000 lbs. All models wired to NFPA 79 standards for operation on 480 volt, 3 phase, 60 hz. Other voltages available at additional cost. 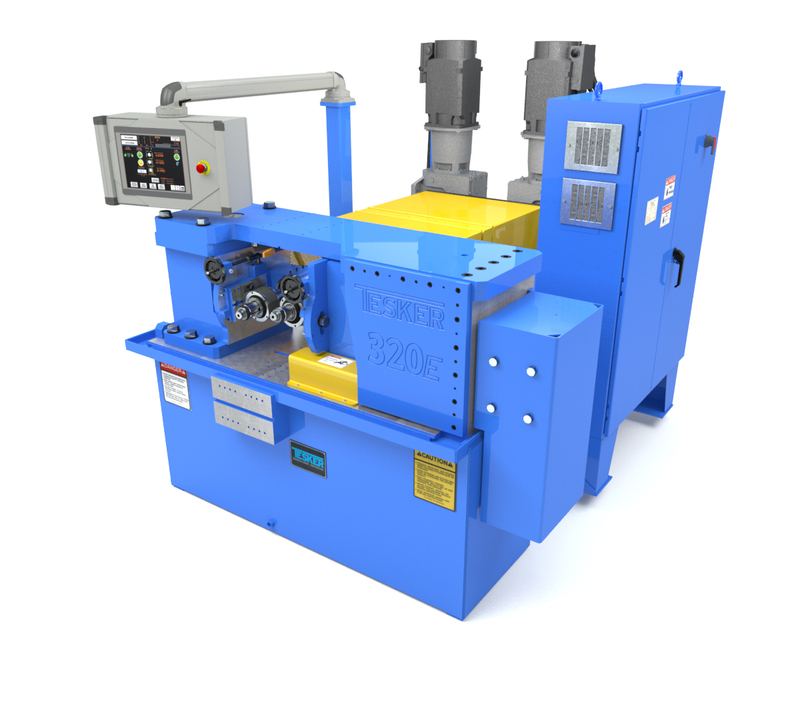 Used in heavy rolling, function releases rolling force slowly to prevent deformation of thread form. Automatic feed slide oil system. Used when rolling threads on part of a rod. The rod is thrufed until it bumps the limit switch and the head opens up. The limit switch can be positioned from behind the dies to the gear boxes at rear of machine allowing a thread length anywhere in this range. Permits separate rotational adjustment of one spindle to the other for matching of infeed or helical slow feed dies, keeping die faces even when desired. Dies can be matched laterally, but when infeed rolling close to a shoulder, rotational line-up is desirable. Helical slow feed should only be radially lined up. Coupling is not needed for the normal infeed or thrufeed rolling. Spring loaded part stop positions part to the desired location for infeed rolling and is spring loaded for slight part movement. Hand operated holds part on support blade so fingers are at a safe distance during rolling. An adjustable mechanical stop that prevents over-rolling the tail-end of thrufeed bars. Gives a reference for adjusting the left main head die for part taper. Behind the spindle support blocks. Gives more part clearance (large head bolts, etc). Contains parts out the back of machine. One needed for each size. Captures material between dies and work support blades for running high-speed studs and threaded rod.